With Patrick Long driving one of the Porsche RS Spyders at Sebring and Petit Le Mans this year, he won’t be able to complete a full season with 2005 GT2 Champions Petersen Motorsports / White Lightning Racing – but he will race for the team in the remaining eight ALMS events, with 2005 partner Jorg Bergmeister. The tall German will be joined by his brother Tim and by Nic Jonsson at Sebring in two weeks’ time. Bergmeister and Long won half of the races last year, and took nine podium places, during an outstanding year from the team. “It’s bittersweet that I won’t be running with the team in the long distance races but I feel like I’m still running for the championship,” said Pat Long. “I’m a racing driver and any car, anytime, I’m going to be pushing for wins; especially with Petersen who has really become my racing family. It’s an exciting year with all the competition and I think it’s going to be one of the most challenging seasons ever in GT2. 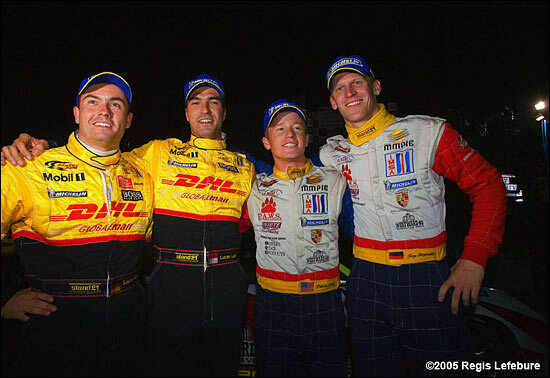 Bergmeister and Long, with Lucas Luhr, started 2005 with a GT2 win at Sebring. Here are the two regulars, celebrating ultimate success at the opposite end of the 2005 season - with two of their Porsche (Spyder) mates.